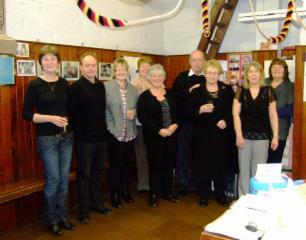 Ringing in the New Year were (left to right), Lynn, Andrew, Dawn, Barbara, June, Stuart, Jennifer, Kath and June. For the third year in succession we rang the bells at Midnight to say goodbye to the old year and to bring in the new. The team in the photo rang Plain Bob and Grandsire Triples from 11.40 up to just before midnight. The bells were silent then until exactly midnight. 12 strokes of our Tenor bell coinciding with Big Ben on the radio and we were off in to Plain Bob Triples to welcome in the New Year. Ringing in the New Year is a tradition that goes back many years in Church towers throughout the UK and one we revived in 2008. We have been quite busy ringing over the Christmas period. All eight bells were rung prior to the Carol Service on Christmas Eve, then again prior to Christmas Day Morning Service and again on Boxing Day before the Sunday Morning Service. We would like to wish everyone a Happy Christmas. Our Tuesday night practice fell victim to the snow which has fallen nearly a foot deep in South Yorkshire. Hopefully we will be back in business next Tuesday. If our practice is cancelled we will post the information on the home page and Ringing This Week page of this website. Please check before setting off to visit us. 20/11/10 - Jasper W Snowdon Memorial Lunch. Members of our team and over 100 other ringers attended the Jasper W Snowdon Memorial Lunch held at the Craiglands Hotel, Ilkley. Prior to the lunch there was general ringing and a Commemorative service at All Saints Ilkley. Jasper Whitfield Snowdon was the first President of the Yorkshire Association of Change Ringers, 2010 is the 125th anniversary of his death. We rang all the bells half muffled prior to the morning service from 9.15 to 10.00. We rang a half muffled Quarter Peal of 1264 Plain Bob Major in 47 minutes prior to the evening service, to commemorate The Fallen. More information. 4 members of our team met up with 10 other members of the Sheffield Branch YACR to ring on the 11cwt ring of 8 bells at Christ Church, Dore. We rang from 10am to 12 noon. The photo left is of Christ Church, Dore in the November sunshine. 2 Quarter Peals were rung at Ecclesfield, one on Saturday 23rd and one prior to Evening Service on Sunday 24th. Both were rung to celebrate the Ruby Wedding Anniversary of Ecclesfield ringers Stuart and Jennifer Armeson. The quarter on Saturday included Stuart and Jennifer and friends from the YACR. The quarter on Sunday was by our Sunday Service Band. We held a successful coffee morning in the Church and raised nearly £400 for the Peal Appeal. Thanks to everyone who came along and helped and those of you who came to support us by purchasing the coffee and cakes. Prior to the Harvest Evening Service we rang a special quarter peal. 1280 changes of Plain Bob Major in 48 minutes. The ringing was in remembrance of Nancy Hawley. More information about the quarter peal. We had a busy weekend, as well as ringing for the wedding at Sheffield Cathedral (see below) St Mary's Ecclesfield was holding its Flower Festival for 3 days. We opened up the tower to visitors and had a steady stream of interested people coming up to the ringing chamber and some went up to the bell chamber to see the bells. Our team and our supporters did a superb job acting as guides, giving talks, demonstrating ringing and making sure visitors down in the Church found the tower entrance. Using our CCTV system we made sure that those who did not want to climb to the belfry could see live pictures from above and recorded footage of the bells and ringers ringing them. 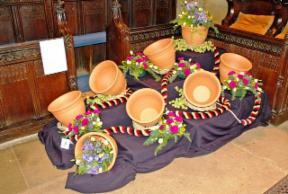 As part of the Flower Festival we had our own display. The theme f or the festival was Marriage Blessings. Our display (pictured) shows 8 bells ringing represented by plant pots at various angles and flowers to represent the sound going forth as the bells speak. Members of our team spent a very enjoyable couple of hours ringing the bells for a wedding at The Cathedral Church of St Peter and St Paul, Sheffield. Our ringing friends at Sheffield Cathedral had gone to take part in a ringing competition and we were pleased to be asked to take their place. Photo taken outside the Cathedral Ringing Chamber. 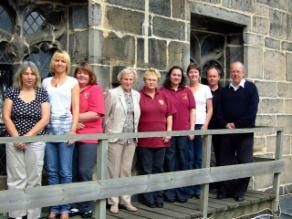 Left to Right: Kath, Helen, June, Nona, Jennifer, Katie, Lynn, Andrew, Stuart. 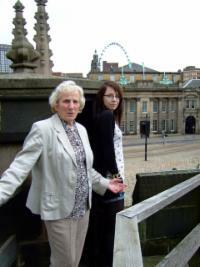 We were supported by Nona and Rosanna (pictured) who acted as our lookouts. They did a great job standing on the Cathedral roof and letting us know in the tower when the bride arrived so that we stopped ringing at the right time. Once we had finished we dashed back to Ecclesfield as the Flower Festival was taking place at the same time and we had left some of our ringers looking after tower tours and giving talks to interested people. On the evening of Monday 13th Stuart and Andrew were invited to give a presentation/talk to members of the Barnsley Schwäbisch Gmünd Twin Town Society at Silkstone Lodge, Barnsley. The talk included bell ringing in general as well as the Peal Appeal information and video clips of ringing at Ecclesfield. To round the evening off some of the audience were invited to take part in change ringing on handbells and managed plain hunt on 6. Members of the team spent the day moving tables, constructing a gazebo, setting up and staffing our stall at the Ecclesfield Gala in the Park. Themed around pirates there were raffles, a treasure hunt map, find the lucky lolly with prizes of drinks, sweet hamper (donated by Cadbury Trebor Bassett) and a teddy bear. Special thanks to Helen, Barbara, June, Lynn, Jennifer, Kath, Stuart H, Stuart A, Jason and Philip for their help organising, setting up and staffing throughout the day. The bells prior to the Christening Service on 5th September were sponsored by Dot and Pat Lee to celebrate the christening of their grandson Harrison Alfie Lee. The ringing consisted of 720 changes of Plain Bob Minor in 30 minutes. One of our ringers on a 1 week family holiday in Lincolnshire joined in the ringing with local ringers at two 6 bell towers. These were St Mary's, Mablethorpe and St Wilfrid, Alford. 6 members of our team rang the bells at St Nicholas, Bradfield for 2 weddings on Saturday 28th. As the weddings were around midday we had a picnic lunch taking in the beautiful scenery at the same time. 6 of our team joined members of the Sheffield Branch of the YACR for a joint ringing meeting with the Derby Diocesan Association of Church Bellringers - Chesterfield District, at The Parish Church of St Mary and All Saints, Chesterfield. Better known to most of us as the Crooked Spire. From 7.00pm to 9.00pm we rang on the 25cwt 10. 01/08/10 - Special Quarter Peal for Sue's Last Service as Curate of St Mary's and Ruby Wedding Compliment to Barbara and Len Rann. We rang a Quarter Peal this morning prior to Sue Hammersley's last service as Curate of St Mary's, Ecclesfield. The Quarter Peal also celebrates the Ruby Wedding Anniversary on this day of Barbara and Len Rann. 1260 changes of doubles in 46 minutes. More information about the Quarter Peal. Prior to the Evening Service we rang a Quarter Peal. 1260 Doubles, 3 methods and 1 variation in 46 minutes on the back 6 bells. Rung in affectionate memory of Jack Phillips, one time Verger at St Mary's. Also to mark the anniversary of the passing of David and Freda Thurlby. More information about the Quarter Peal. On Tuesday evening we rang a special Quarter Peal requested by the Ecclesfield Brownies. 1260 Grandsire Triples in 47 minutes to celebrate the 100th anniversary of the Brownie Guide Movement. More information about the Quarter Peal. On Friday evening the bells were rung to a Quarter Peal of 1344 changes of Plain Bob Major. The ringing was to celebrate the Golden Wedding Anniversary of Pat and Graham Blackburn. More information about the Quarter Peal. Held every year, this residential course for bell ringers runs from Friday evening to late Sunday afternoon and uses towers in the Sheffield area for the practical sessions. Each bell ringer is tutored in a method of their choice and then provided with tower-based practical sessions. On Friday evening 9th July Ecclesfield tower played host once again to some of the students on the course. A group, helpers and a team leader held a practical session concentrating on a bell ringing method. The bells were rung from 7.45pm to 9.00pm. On the evening of 7th June a visiting team of ringers successfully completed a full length Peal on the bells at Ecclesfield. 5120 changes were rung in 3 hours and 7 minutes. This is the 88th recorded peal since records began in 1843 and the first since November 2007. More information about the Peal. 2 of our ringers are back from a week on holiday in Cornwall. While there they joined in with the local team ringing for Sunday Service on the 6 bells at Veryan, (pictured) and joined in with local ringers on 2 practice nights at St Goran (6) and Kenwyn (8). This evening the bells were rung to a Quarter Peal of 1260 changes in 3 methods and 1 variation Doubles on the back 6 bells. The ringing was to celebrate the Golden Wedding of Arthur and Norma Priest. More information about this quarter peal. This morning we rang a Special Quarter Peal to celebrate the baptism of Benjamin Guy Richard Hackett. 1260 changes of 2 methods and 1 variation Doubles were rung in 45 minutes on the back 6 bells. More information about this quarter peal. We were pleased to welcome a group of ringers from North America to our practice night on Tuesday 18th. They were on a ringing tour of the UK and had chosen to visit Ecclesfield and ring with us on our practice night. Called the Butler's May Ringing Tour the ringers came from Washington, Philadelphia, Rochester and New York. Ecclesfield entered the branch striking competition held this year at St James, South Anston. Sheffield Cathedral won, joint second were Rotherham and Walkley, Ecclesfield were 4th. 2 members of our team were in the Sheffield and District team that entered the Yorkshire Association of Change Ringers inter-branch striking competition held at Birstwith. Sheffield came 3rd, Western Branch were the winners. The aim of a Striking Competitions is for each team to ring with perfect rhythm and a steady beat without clashing. The ringing is judged, the winning team being the one with least faults. 6 of our ringers joined ringers from other towers in the Sheffield Branch for a day of ringing in towers around Southwell in Nottinghamshire. The day was organised by Rotherham Minster's Ringing Master and enjoyed by around 20 ringers, their relatives and friends. In typical bank holiday tradition the weather delivered rain, glorious sunshine and hail in rotation every hour. We started at 9.30 am with ringing on the 6 at Oxton (left) followed by the anti-clockwise 12 at Southwell Minster (above). Pub lunch over and we were off to ring on Upton's 6, the 6 at Thurgarton and finally the 6 at Rolleston where a flower festival was taking place. One of the bells at Rolleston was cast in 1399, probably the oldest bell most of us had ever rung. Ecclesfield Church hosted another evening of entertainment this time featuring Sheffield Folk Chorale who provided a superb varied 2 hour programme of folk songs. Around 120 people came to the concert and along with the Chorale we must have had nearly 200 people in the building. We would like to thank Sheffield Folk Chorale and all of you who came and supported our fundraising concert. Also we wish to thank the Vicar and PCC for allowing us to use the Church. Thanks also to the members of our team who staffed the ticket desk, kitchen, refreshments, programmes and to Philip for being MC for the evening. 6 of our team rang in a Quarter Peal with 2 ringers from St Mary's Handsworth at Handsworth on Sunday afternoon. The quarter was rung prior to the Scouts' St George's Day Parade Service. We rang 1260 changes of Plain Bob Triples in 43 minutes. More information about the Quarter Peal. While we were ringing at the Sheffield Branch meeting (see below), a team of ringers was visiting Ecclesfield from 16.00 to 16.40 to ring on our bells. They were on an organised trip from places as far afield as Wisborough Green (West Sussex), Portsmouth and Petersfield (Hampshire). 5 members of our team met with other Sheffield Branch ringers to ring the 8 bells at Rawmarsh and the 6 at Wentworth. Afterwards we went to the George and Dragon for a pub meal to finish off a really enjoyable afternoon. The Ringing World the weekly journal for Church Bell Ringers edition number 5161 March 26, 2010 contained the annual quarter peal analysis for 2009. The country, county and leading towers information is published each year. Ecclesfield shared first place with Sheffield Cathedral as the towers in South Yorkshire that have rung most quarter peals in 2009. We rang a Quarter Peal prior to the Evening Service for Palm Sunday. 1274 changes of Plain Bob Triples in 48 minutes from 5.30pm to 6.20pm More information about the Quarter Peal. Members of Ecclesfield team attended the 10 bell branch practice at the Minster Church of Rotherham All Saints on Tuesday evening. We did not hold our usual practice night at Ecclesfield. Ecclesfield Church hosted a marvellous evening of entertainment which started with ringing of our Church bells from 6.45 to 7.20 by members of our team and visitors from Handsworth, Sheffield Cathedral and Thrybergh. Ecclesfield Handbell Ringers and Grenoside Singers then provided a varied 2 hour programme of popular and classical music. There was plenty of interest shown by the audience in both the handbell team and the singers during the refreshment break and after the concert had finished. Around 130 people came to the concert and along with the singers and handbell team we must have had nearly 200 people in the building which was really nice and there was a lovely friendly atmosphere. We would like to thank both groups and all of you who came and supported our fundraising concert. Also we wish to thank the Vicar and PCC for allowing us to use the Church and for their help setting up the stage and seating. Thanks also to the members of our team who staffed the ticket desk, kitchen, refreshments, programmes and to Philip for being the MC for the evening. If you are interested in either of these groups, you can find more information by using these links to Ecclesfield Handbell Ringers and Grenoside Singers. The Sunday Service band marked Mothering Sunday by 2 sessions of ringing. In the morning all 8 bells were rung for 45 minutes before the 10.30 traditional Family Service for Mothering Sunday. Later in the day and prior to the Evening Service we rang a 6 bell Quarter Peal from 17.30 to 18.15 followed by another 10 minutes of general ringing. More information. The 11th March edition of Look Local free weekly newspaper contained an article about our Peal Appeal and the 2 concerts being held in the Church to raise funds. This links to the report in Look Local. Prior to the Evening Service we rang a Quarter Peal. From 5.30pm to 6.15pm 1260 changes of Plain Bob Minor on the front 6 bells. More information. 6 of our team met up with other ringers from the Sheffield Branch of the Yorkshire Association of Change Ringers in the afternoon to ring on the 8 bells at St Mary's, Handsworth. Afterwards we moved on to St Mary's Beighton for a Ringers Service, a very nice ringers tea provided by the Beighton ringers, the Branch AGM and then an hour ringing on the 6 bells of St Mary's. We did not hold our regular practice night but we did ring the bells for the Baptism and Confirmation Service with Bishop Cyril. We rang all 8 for 45 minutes prior to the service at 7.30pm. We were pleased to welcome the Brownies and their leaders on Monday night. They came to visit the tower and were shown around the ringing chamber and belfry. 2 of our ringers demonstrated how bells operate and the Brownies were given a short talk about ringing. We held our second bellringers coffee morning today. Members of the team cooked savouries, provided cakes, staffed the kitchen, sold tickets for the concerts, donated and sold Bric-a-Brac, raffle prizes, promotional material, displays, computer presentations, conducted tower tours and networked with many people who came to our event. It was a really enjoyable interesting 2 hours and we would like to thank all those who came to visit and made donations. 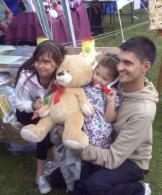 The money raised goes to help the Peal Appeal. We would like to thank the Vicar, David and St Mary's PCC for allowing us to use the Church for this event. 5 members of our team joined other ringers to attend February's Sheffield Branch Ringing Meeting. We had a pleasent morning ringing at St Helen's, Treeton (6 bells) and St. Mary Magdalene, Whiston (8 bells). This evening we rang a Special Quarter Peal to celebrate the 89th birthday of Phyllis Gledhill. 1280 changes of Plain Bob Major were rung in 47 minutes starting at 7.30pm. More information about this Quarter Peal. If you are interested in having the bells rung for you please have a look at our Say it With Bells web page. 7 members of our team joined with ringers from all areas of Yorkshire to attend the YACR General Meeting on Saturday 6th. As well as the meeting there was ringing at 5 towers, Boroughbridge, Kirby Hill, Sharow and Aldborough followed by a Service at Aldborough. Final ringing of the day was at Ripon Cathedral. Information about our Peal Appeal and about St Mary's Church are in this week's edition of the ringers' weekly journal, The Ringing World. If you use this link to the Ringing World Website you can see the photo of the Church and a small part of the published article. The snow has gone (for now) and the temperature is above freezing. Ringing has resumed following its usual Sunday, Tuesday and Friday format. Please come and see us but check the Ringing This Week link to make sure ringing is taking place. No ringing took place this week due to exceptional weather. Sub-zero temperatures along with regular snow fall has made getting to Ecclesfield difficult with no guarantee of getting home again. To raise funds for the Ecclesfield Peal Appeal we will ring the bells to celebrate events or special occasions for you or your family and friends. Today we rang the first, prior to the Evening Service to celebrate the birthday of Helen Margaret Boyes. 1272 Kent Treble Bob Minor. More information about this Quarter Peal. If you are interested in having the bells rung for you please have a look at our Say it With Bells web page. 6 of our team attended the Sheffield Branch ringing meeting on Saturday 2nd January. Around 25 members of the branch met at The Cathedral Church of St Marie, Norfolk Row for afternoon ringing on the 25cwt 8. Following the ringing we had a very nice tea prepared by Sheffield Cathedral Ringers. A short branch business meeting followed. Evening ringing was at Sheffield Cathedral on the 34 cwt 12. While we were ringing the snow started to fall and we left footprints in the snow as we left. There is something magical about listening to 12 bells ringing at night, in the snow, with the Christmas lights all around and the Cathedral floodlit to the top of the spire.